Most of the structures that I write about cannot be taken down in 10 hours to fit into two 40ft shipping containers. Okay, so it’s a temporary building and has only been to Brighton twice but to me that can count as Heritage. But is it Hot? 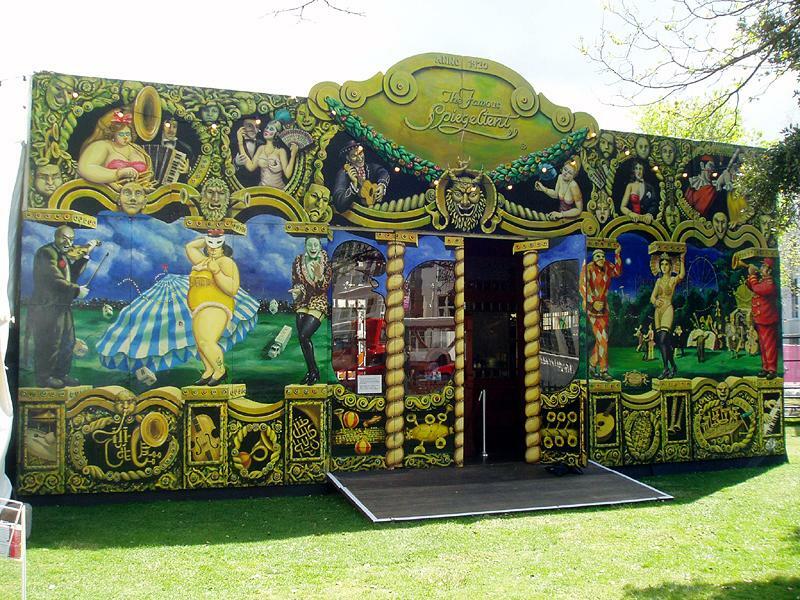 Step inside to find out…Welcome to the Famous Spiegeltent! “Outrageously seductive and full of surprises” said the Brighton Festival Fringe guidebook. Not knowing what to expect, I was intrigued. All I could really remember was that last year, a couple of nearby residents weren’t too happy about the volume of the music when the tent was based in the gardens of the Royal Pavilion. A lavish entrance sets the scene with various painted tuxedoed freaks, fat ladies, violinists and other circus-folk. Inside, I met with David Bates from Melbourne, the owner of the tent that is just one of a handful surviving from 1920s Belgium, who let me in on a few trade secrets. The 22-sided tent takes 8 hours to construct and consists of over 3000 pieces, each of which is light enough to be carried by one man. The diameter of the main circle of the tent is 19m with an overall floor area of 320m2 and 300 contact points with the ground. The ageing wooden sub-frame was recently replaced with a steel and aluminium equivalent for strength and safety. A team of around ten is required to construct and dismantle the tent aided by two experts from the Klessens family of Belgian Spiegeltent builders. David wouldn’t give too much away about La Clique, his in-house burlesque sideshow, and after seeing it for myself, I won’t either, other than by saying that it is truly breathtaking. Call 647100 for information and tickets – now! ‘Greater Brighton’ was created on 1st April 1928 when Brighton absorbed the villages of Rottingdean, Ovingdean, Falmer and Patcham. The town expanded nearly fivefold to 12,503 acres, the same size as Chicago at the time. 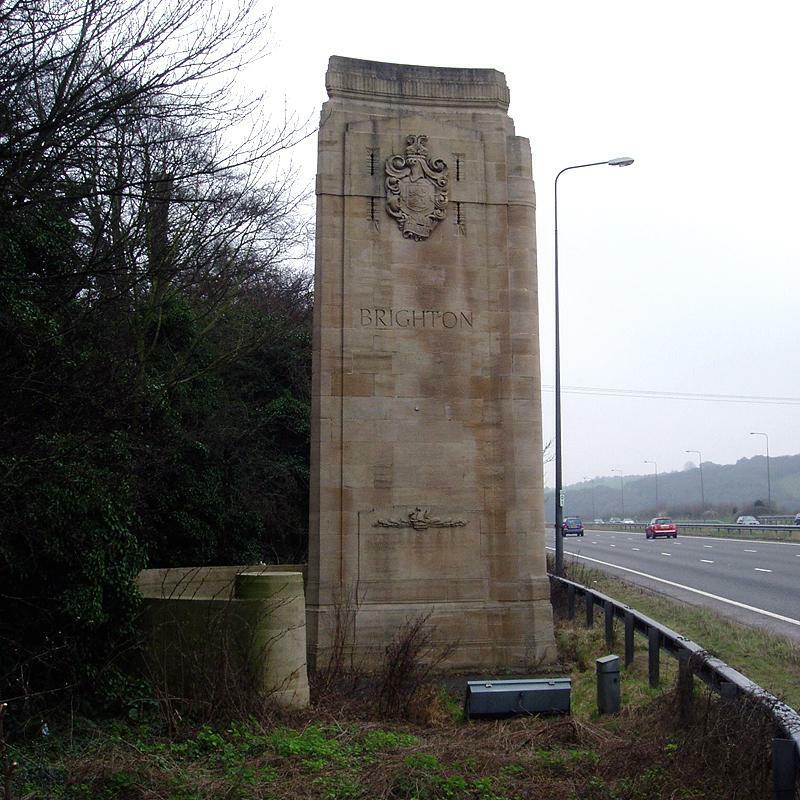 Two stone pillars, the Pylons, were constructed on opposite sides of the London Road to mark the new northern boundary. This key moment in the history of Brighton is certainly worthy of an explanation. This story centres on the controversial Alderman Sir Herbert Carden (1867-1941), a visionary who helped to sculpt Brighton into the city that we know and love today. 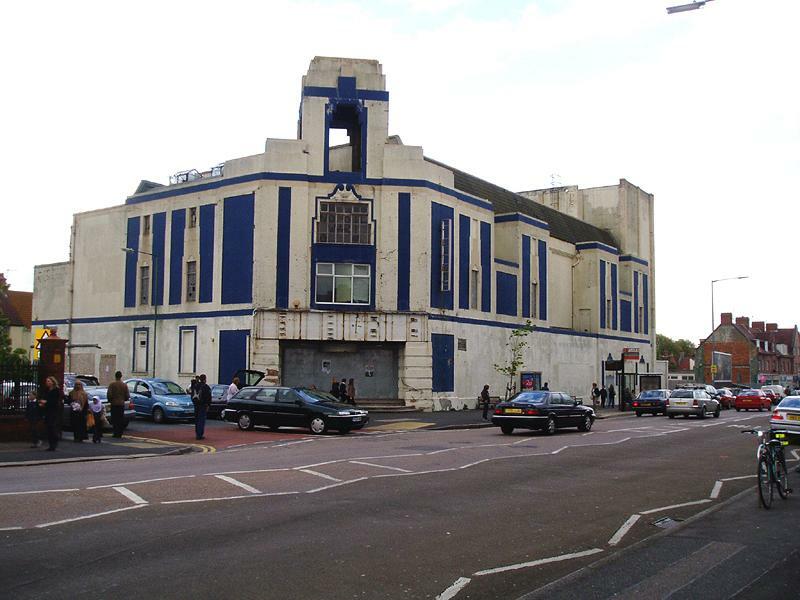 From the late 1800s, Carden bought farmland around Brighton & Hove and sold it on to the town without profit. He persuaded the council to become pioneers in civic enterprise which included setting up corporation electricity, telephones, trains and housing estates. Carden was a Labour supporter and became a town councillor in 1895. He was made an honorary freeman of the borough on 28th October 1926 and was knighted in 1930 by Prime Minister Ramsay MacDonald. The sharp lines of the Pylons reflect his love for the Art deco movement and it was this love that caused the controversy. He wanted to replace the Pavilion and the whole Regency seafront with Embassy Court style buildings which led to the formation of the Regency Society! The Pylons were designed by John L. Denman and have foundation stones laid by the Duke and Duchess of York (who became King George VI and Queen Elizabeth). Coins, newspapers and a bound book recording the laying of the foundation stones were buried inside. The cost was borne by a public subscription of £993 and a personal contribution from Carden of £2,555. The western pillar bears the message, “Hail guest, we ask not what thou art. If friend we greet thee hand and heart. If stranger no longer be. If foe our love shall conquer thee”. They were actually built 35 yards south of the border. The Pylons today mark the city boundary of Brighton & Hove. The London Road has more than doubled in width so the pillars now sit in the centre and on the east side of the road. The late and great Conservative councillor, John Sheldon, hoped to organise the construction of a third pylon to retain symmetry and to celebrate the millennium. Due to funding problems, his idea was never realised. What a great shame. The national organisation of St Dunstan’s was established in 1915 and has therefore been helping blind ex-servicemen for ninety years this year. This milestone provided me with a great opportunity to research the history of an extremely successful institution and its imposing building at Ovingdean Gap. St Dunstan’s was founded by Arthur Pearson, soon after he had become the President of the National Institution for the Blind. Pearson was the owner of the Evening Standard and Daily Express, and had lost his own sight due to glaucoma. St Dunstan’s was originally called the Blind Soldiers and Sailors Hostel when it was based in Bayswater Road, London, and adopted the new name when it moved into St Dunstan’s Villa in Regent’s Park. Pearson’s revolutionary vision was that the blind should no longer just receive charity and should instead lead useful, independent and fulfilling lives of their own. 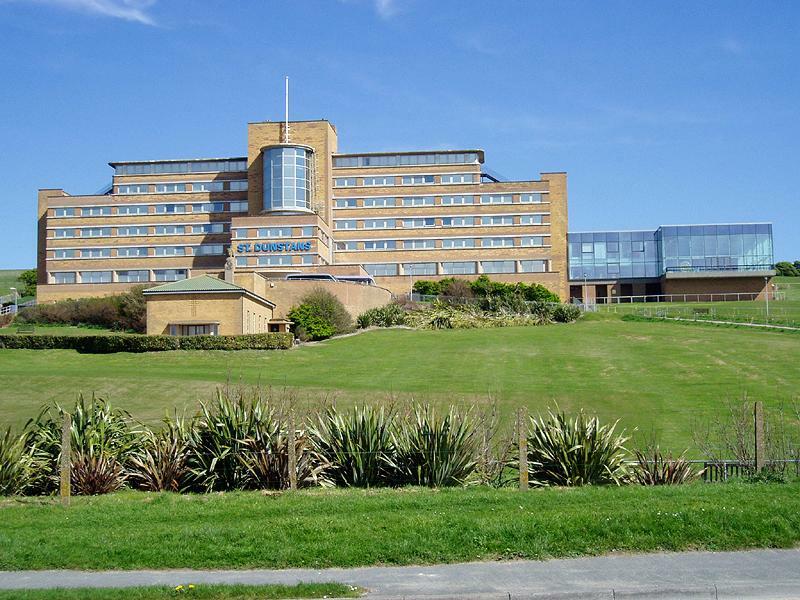 The building in Ovingdean, known simply as “St Dunstan’s” is actually called Ian Fraser House. It was constructed from 1937-39 in the International Modern style to the designs of Francis Lorne. It is a seven storey brick giant with a glass bow and a square tower, and is said to have been built to resemble a bi-plane. A sculpted figure holding the St Dunstan’s badge adourns the front of the building. A new wing was added to the south in1975 that contains the swimming pool. The building is mainly used for training, holidays and convalescence. The Queen has actually visited twice. I recently visited the building with my neighbour Joyce, who is blind, and was given a guided tour of the 1930s interior. Another St. Dunstaner, who I would love to meet, is blind Billy Baxter, who recently travelled 167mph on his motorcycle. Above all else, the team spirit that I witnessed was fantastic and an inspiration to behold. Although St Dunstan’s enjoys a secluded prime position on the Downs, it unfortunately fails to harmonise with its surroundings in the way that nearby Roedean School does so well. I must say, however, that when the weather is right, the orange of the bricks combined with the blue sky reflected in the windows creates quite an image. The condition of the building is excellent and it is certainly a pristine example of an important architectural period, so perhaps I can be persuaded to forgive the poor positioning. Oh, and before I forget…Happy birthday St Dunstan’s! Thousands of A4 yellow posters appeared as a protest around town last year after the council unveiled plans to move Hove’s wonderful library from a delightful purpose-built building to the nearby town hall. The Church Road library was donated to the town by Andrew Carnegie, the Scottish-born American steel baron. Chris Hawtree, master deliverer of posters and founder of the Friends of Hove Library, tells me that the fight is not yet over. Andrew Carnegie was born in Dunfermline, Scotland, on 25th November 1835. Soon after moving to the USA with his family, he worked as a bobbin boy in a cotton mill. By 1865 he had established the Carnegie Steel Company which he later sold for $480 million. Throughout his life, he contributed massively to various charitable causes. In 1881, he began building libraries throughout the English-speaking world. By 1917, the termination of the program, Carnegie had spent over $56 million on a staggering 2,509 libraries. Before his death on 11th August 1919, Carnegie had given away over $350 million! 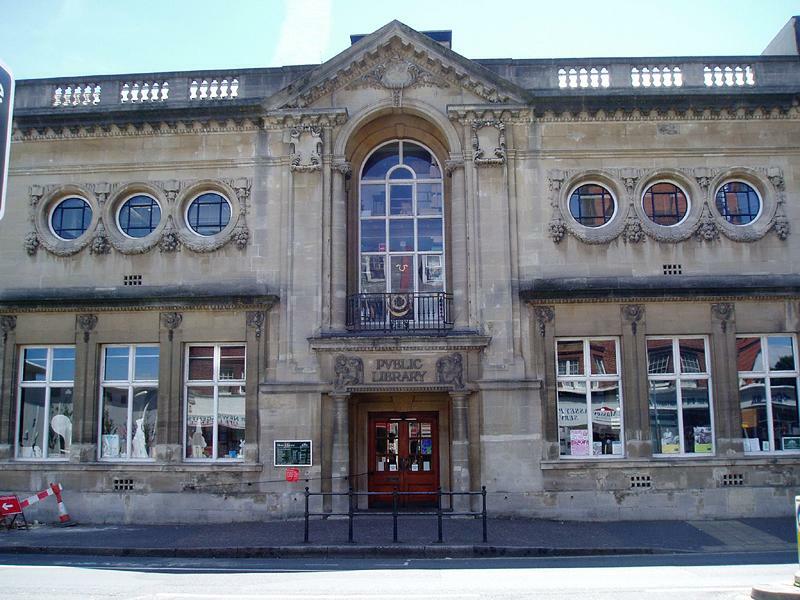 Hove’s Grade II Listed library opened in 1908. The semi-circular lending library was designed to allow free access to the books with maximum staff supervision. The Wolseley Room, a first floor addition, was paid for by Lady Wolseley to house her local studies archive and the papers of her father, Lord Wolseley. Originally a cupola (small roof dome) graced the building but I’m told that a buddleia growing inside it caused havoc with the brickwork. Had it been stemmed in time, the cupola would have survived. The council did finally drop its plans to move the library. Amazingly, they now want to mix books for borrowing with the reference section, angering the 4,500 strong Friends of Hove Library. As I like to keep my column separate to my work in politics, I’ll leave it to the reader to see which party is causing the trouble and why. Chris recently told me, “Any successful library, large or small, acquires its own character, so much so that each reader feels as if it is a house of one’s own. The Carnegie Library does that marvellously. Its distinct, separate rooms – and skilful use of daylight throughout – provide everybody with a second home.” We discussed what makes the library great and what could be done to make it better. Watch this space for the announcement of the campaign to reinstate the long-lost cupola.